The MAIB has published a Safety Bulletin following the carbon monoxide poisoning on board the Bayliner 285 motor cruiser Arniston in Windermere, Cumbria on 1 April 2013, resulting in two fatalities. A bank holiday weekend on board an 11 year old Bayliner 285 motor cruiser ended tragically when a mother and her 10 year old daughter died. Initial findings indicate the deceased were poisoned by carbon monoxide. A “suitcase” type portable petrol-driven generator had been installed in the motor cruiser’s engine bay to supply the boat with 240v power. The generator had been fitted with an improvised exhaust and silencer system which had become detached from both the generator and the outlet on the vessel’s side. 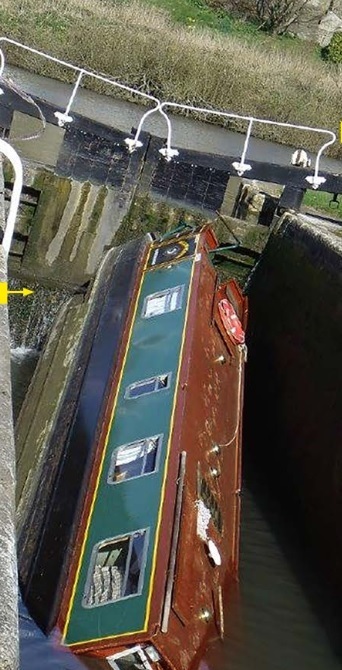 As a result, the generator’s exhaust fumes filled the engine bay and spread through gaps in an internal bulkhead into the aft cabin where the mother and daughter were asleep. When the owner of the boat awoke in the boat’s forward cabin, he was suffering from carbon monoxide poisoning but was able to raise the alarm. The mother and daughter could not be revived. The boat’s carbon monoxide sensor system did not alarm because it was not connected to a power supply. 1. Portable air-cooled petrol generators are readily available and inexpensive, but they are usually intended for use in the open air. The use or permanent installation of these engines on boats, particularly in enclosed spaces or below decks, increases the risk of carbon monoxide poisoning. 2. It is essential that engine exhaust systems are fitted and maintained to direct poisonous fumes outside the vessel clear of ventilation intakes and accommodation spaces. Work on these systems should therefore only be undertaken by suitably qualified marine service engineers using approved parts and following the equipment manufacturer’s instructions for marine installations. 3. Carbon monoxide is a lethal gas, which has no smell, no taste, is colourless and is extremely difficult for human senses to detect. All boaters need to be vigilant and recognise the signs of carbon monoxide poisoning, which can include: headaches, dizziness, nausea, vomiting, tiredness, confusion, stomach pain and shortage of breath. 4. Carbon monoxide is a silent killer that is just as lethal afloat as it is ashore. The correct positioning and the regular testing of any carbon monoxide sensors, whether powered by a boat’s electrical supply or self-contained, is essential. Carbon monoxide sensor alarms that do not work correctly should be replaced. When selecting a carbon monoxide alarm preference should be given to those marked as meeting safety standard EN 50291-2:2010 which are intended for use in a marine environment. The Marine Accident Investigation Branch is carrying out an investigation into the ejection of a family of six from a RHIB on 5 May 2013. The unmanned RHIB subsequently executed a series of tight high speed turns, running over members of the family in the water, causing two fatalities and serious injuries to two people. At this early stage in the investigation, the mechanism that led to the family being ejected from the RHIB into the water, is not clear. At approximately 1549 (BST) on Sunday 5 May 2013 a family of two adults and four children were ejected from their 8.0m rigid hulled inflatable boat (RHIB) into the water. They were manoeuvring the boat at speed in the Camel Estuary near Padstow, Cornwall, UK. The RHIB was fitted with a kill cord, but this was not attached to the driver at the time of the accident. Consequently, when the driver was ejected from the boat, the kill cord did not operate to stop the engine and the RHIB continued to circle out of control, at speed. As the RHIB circled, it ran over the family in the water a number of times, leading to the death of the father and the 8 year old daughter and serious injuries to the mother and the 4 year old son. 1. Test them regularly to ensure that the engine stops when the kill cord mechanism is operated. 2. Make sure that the cord is in good condition – not frayed. 3. Always attach the cord securely to the driver, ideally before the engine is started, but certainly before the boat is put in gear. 4. Stop the engine before transferring the kill cord to another driver. An investigation was launched following the sinking of the fishing vessel Sarah Jayne with the loss of one life off Brixham on 11 September. In another accident a small ferry with six passengers onboard sank in Loch Lomond on 19 September. All passengers and the crewman were rescued. MAIB inspectors were deployed to both scenes to gather evidence and interview those involved.